Reviewed by the Canstar Blue Judging Panel on Aug 25th, 2014 . In certain parts of New Zealand, having a heat pump isn’t really a luxury – it’s close to an imperative. In the milder areas it’s not so bleak, but heat pumps are one of the best ways to make your home comfortable in the colder months and cool in the hotter ones. Like any product, however, heat pumps require some “fiddling” to get the temperature just right. Wouldn’t it be great if you could set your control unit to ensure you were always in the perfect climate? Wouldn’t it be even better to have this climate waiting for you when you arrived home after a long day? Mitsubishi Electric has developed a smartphone / internet application to help you have more control over how your heat pump operates. It can act as a remote control peripheral, powering on and setting temperature, fan speed and airflow direction of any heat pump device you set it up for. It gives you a bird’s eye view of all units in the house, so you can dictate the temperature in each room to suit the occupant. You can write rules for the unit to follow. If the condition set is “Power Save”, it will have predetermined “off” times to help you save as much power as possible. If it’s set to “Master Bedroom”, the fan speed will be slowed while you sleep in order to remain as quiet as possible. Turns out, it’s having the means to ensure your heating and cooling is “just so”. The idea behind the Wi-Fi Heat Pump Control App, according to Mitsubishi Electric, is to give busy New Zealanders the ability to control the temperature of their house before they walk through the door. There’s no reason you should ever come home to a refrigerator when you can simply command your heat pump to power up 20 minutes before you roll into the driveway. The Canstar Blue judging panel especially likes the inclusion of a “minimum room temperature” option, another failsafe for those who neglect to monitor their devices. It makes air conditioners intuitive, which in turn helps makes conditions at home so much more comfortable. Patrick Avevell of Appliance Retailer, one of our Innovation Excellence Award judges, says: “The Mitsubishi Electric app is a great example of utilising one device to effectively manage your appliances. 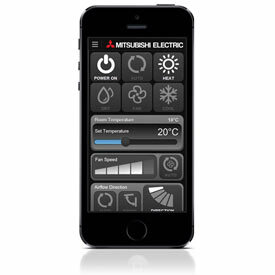 The Mitsubishi Electric Wi-Fi Heat Pump Control app is free to download for iOS and Android devices, and can also be controlled through an internet browser interface. You also need to purchase a Wi-Fi Adapter, which has a standalone price of $429.99, and requires a technician to install. It’s possible to mitigate some of this cost by purchasing it as a bundle with a new heat pump. Our Innovation Excellence Awards have been determined through a panel of judges, who adhere to a strict awards methodology – outlined below. Brands or representatives of brands submitted products for consideration to us for judging. We also accepted consumer submissions, where anyone in the public could submit products they thought were worthy of an Innovation Award. Each submission type was given equal weighting by our judges. A single legitimate submission was all that was needed for a product to be considered by our panel, and only submitted products were assessed. To be described as innovative, we assess both the degree of innovation and the overall impact the product could have. In terms of degree, we consider whether there are any other similar products available, whether it is a “first” in Australia or New Zealand and whether it opens up any new markets. We also assess the potential significance of impacts to the existing market in terms of competition. And, of course, something that’s truly innovative can’t help but have that “wow” factor. In terms of overall impact, we consider the number of people who can benefit from the innovation, the ease and expense of application, and the potential to change people’s lives.